We are living in times of dynamic change which brings with it a range of challenges as well as a wealth of opportunities. For organisations, dynamic change takes away the comfort of predictability and repeatability; doing the same thing and forecasting the same results based on the past isn’t a safe bet anymore. Consequently, predicting future talent requirements is less straightforward. Organisations obviously need people to succeed and it’s people who solve current challenges and meet current demands. However, to achieve success and sustainability in a dynamic environment, organisations also need people who demonstrate potential and the ability to develop. Markets, economies, societies are ever-changing so organisations must adapt. But what does this mean to people like us? People who want to continually build a successful and rewarding career. Dynamic change means we can’t stand still. Evolving organisational requirements mean we have to evolve too. Plus organisational change brings career opportunities for those who are prepared to learn and adapt. To thrive in this type of environment we must put aside old visions of prescribed career paths, expected next steps and professional snobbery. Recognising that our career is personal, dynamic and unique to each of us. My career story is personal to me. Your career story is personal to you. Our aim is to be career adventurers; moving with the times, finding and creating career opportunities as we go. It’s fair to say I have had a varied career path. From researcher to industrial chemist to business leader to entrepreneurial experimenter and talent developer. I suppose I’ve always been a bit of a career adventurer. Everything I have done is linked and is an evolution. I am not one aspect of my career; I am all of it and more. 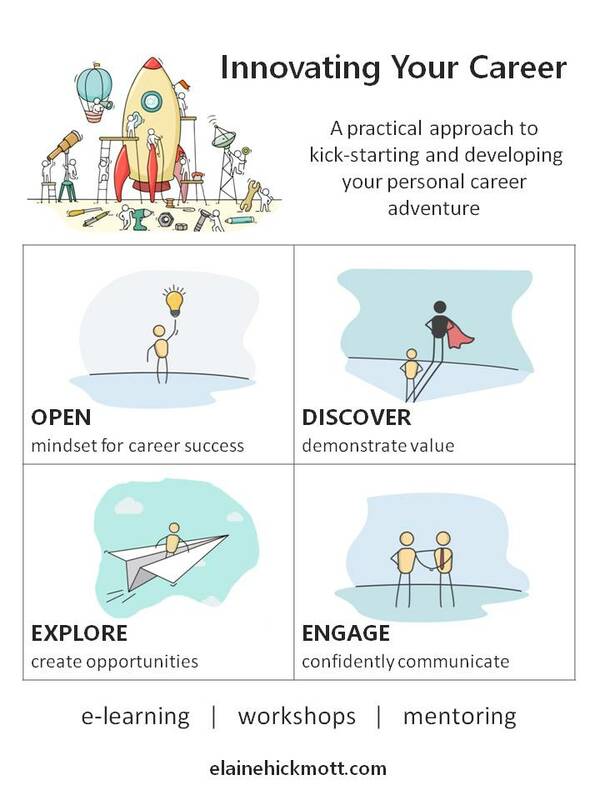 Following a multitude of career conversations, professional development interactions plus my own personal successes (and shaky moments) I was inspired to create the Innovating Your Career approach; a practical framework for adopting the attitude and approach to achieving career success in our dynamic world. At the heart of every successful career is value. In other words, from a career perspective, the benefits to us as individuals and the benefits to the organisations we work for or with. Finding and creating career opportunities; thriving in dynamic times requires a value match between you and the organisation. They need X to succeed; you have the potential to provide the X they require. You want to achieve Y; the organisation gives you the means to achieve it. Plus, in a dynamic environment, this value matching needs to be taking place continually. Not just when you’re looking for your first role or when you get stuck in a career rut. My Innovating Your Career approach is designed to help you achieve these evolving and changing win-win value connections. It is designed to help you build a successful, rewarding career which evolves with you and the world around you. Getting in Touch: I’m always happy to discuss your career aspirations, Innovating Your Career or my services. Drop me a line and we can get the conversation started.